This Spanish edition features three books, three CDs, and a DVD. Learn how to play the piano with this easy, illustrated guide. Covers everything from reading music and playing chords and scales, to performing your first song. The DVD has been exclusively designed for people from both Latin America and Spain, and guides you a thorough beginner piano lesson in a step-by-step manner. Award-winning educator Inti alejandra Viana guides you through the basics of the piano including how to play many Latin American folk songs.Este curso completo le ensenara a tocar el teclado de una forma mas facil. Contiene todo acerca de leer musica, tocar acordes y escalas, hasta interpretar su primera cancion.Este gran paquete contiene: tres libros y discos compactos Aprende Ya! 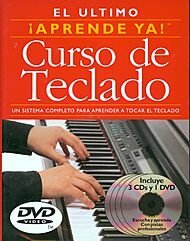 A Tocar Piano; Primer Paso: Escalas Para Teclado; Primer Paso: Acordes Para Teclado Ademes la ventaja de un DVD. Incluye todo lo necesario!